New Delhi: India's premier shuttler PV Sindhu might have to upstage defending champion and familiar foe Nozomi Okuhara as the two finalists of the previous edition are drawn to meet in the quarter-finals of the World Championship, to be held from 30 July to 5 August in Nanjing, China. 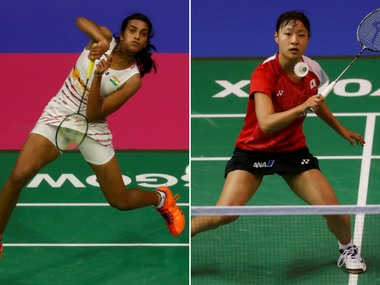 Memories of Sindhu and Okuhara battling in one of the greatest matches of all time during the summit clash in Glasgow last year is still fresh in the minds of badminton aficionados. Okuhara, who was bothered by a knee injury in the latter half of last season, outplayed Sindhu last week in the finals of Thailand Open and the Indian will have her task cut out as she is expected to meet the World no 8 again in the quarter-finals in Nanjing. According to the draw announced on Tuesday, Sindhu is likely to meet Korea's Sung Ji Hyun in the third round. The Indian has received a bye in the opening round, while she will face either Indonesia's Fitriani Fitriani or Linda Zetchiri in the second round. Two-time Commonwealth Games champion Saina Nehwal, who won a silver in 2015 edition and a bronze at Glasgow, will have to battle past 2013 champion Ratchanok Intanon of Thailand and Olympic champion Carolina Marin, whom she is expected to meet in the third round and quarters respectively. The London Olympics bronze medallist will play either Swiss Sabrina Jaquet or Turkish Aliye Demirbag in the second round after getting a bye in the opening round. 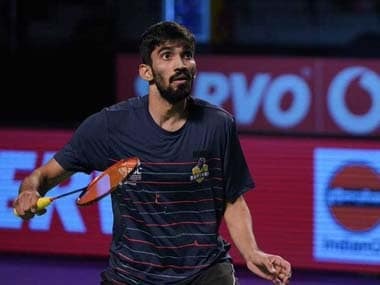 In the men's singles, Kidambi Srikanth, who clinched four titles last season and a silver at the Gold Coast Commonwealth Games this year, will open against Ireland's Nhat Nguyen and is likely to meet Indonesia's Jonatan Christie, 13th seed, in round 3. If he can surpass the hurdles, a meeting with three-time Olympic silver medallist Lee Chong Wei of Malaysia is also a possibility. HS Prannoy, on the other hand, will begin his campaign with a clash against Australia's Abhinav Manota and two tricky opponents in Hong Kong's Wong Wing Ki Vincent and Chinese Taipei's Chou Tien Chen might stand in his way to the quarter-finals, where he is expected to meet the All England champion Shi Yuqi. Among others, B Sai Praneeth will have to contend with Korea's Son Wan Ho, while Sameer Verma faces France's Lucas Corvee in the opening round. In men's doubles, national champions Manu Attri and B Sumeeth Reddy will open against Bulgarian combo of Daniel Nikolov and Ivan Rusev, while CWG silver medallists Satwiksairaj Rankireddy and Chirag Shetty face Olympic bronze medallists Marcus Ellis and Chris Langridge of England. CWG bronze medallists Ashwini Ponnappa and N Sikki Reddy will square off against Chinese Taipei's Chiang Kai Hsin and Hung Shih Han. Ashwini and Sikki will also pair up with Satwik and Pranaav Jerry Chopra to compete in the mixed doubles event. Other Indians competing in the event are Rohan Kapoor and Kuhoo Garg, and Saurabh Sharma and Anoushka Parikh. The young pair of Arjun MR and Ramchandran Shlok, and Tarun Kona and Saurabh Sharma will also compete in the men's doubles competition. Also in action will be Kuhoo Garg and Ningshi Block Hazarika, Jakkampudi Meghana and S Poorvisha Ram, and Sanyogita Ghorpade and Prajakta Sawant in the women's doubles.